Late last June I talked about the importance of body fat and the start of my new campaign #LoveMySizeLoveMyLife. Around that same time, I had come across old photos that had been backed up from my computer- specifically a set that I had taken of myself several years ago. In the pictures I was in a bathing suit and I remembered the reason I had taken them- not to proclaim how awesome I looked that summer but to take a “progress” photo so that I could later look back at all of my “flaws” to see if I had made any progress in “fixing” them. And let me tell you something- looking at those pictures, I looked great! At the time I didn’t realize it though- I was so focused on the little details that I couldn’t see the whole picture. Tell me if this sounds familiar: Jump on the scale immediately after waking up, check the number and then look at the mirror and scrutinize each and every little “imperfect” part. This had become my regular morning routine (and I’ve heard from many others over the years that it’s a similar routine for them as well). It’s certainly not a positive way to start the day! Sure, I knew I was healthy- eating well and exercising regularly however I still found ways to criticize my appearance. As someone who advocates the importance of being happy and healthy mentally and physically, I knew I needed to focus on pushing that critical voice aside. After finding those photos last month I’ve made it a personal goal to really focus more positively on myself. I don’t want to look back on old pictures later in life and see how amazing we all looked and know that at the time I was focused on the fact that I thought my thighs were too wide and my belly too round. Anywho, the point of this- possibly overly personal- story is to encourage you to love yourself. 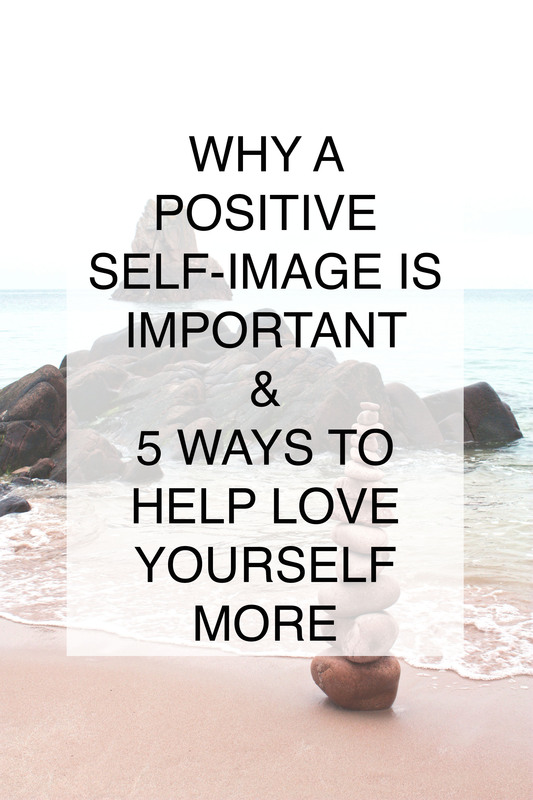 Having a positive body image of yourself is so important as it can substantially affect your mental and physical health. When you love yourself, you treat yourself better. Sure, everyone has good and bad days and may have moments of a low self-image, but having an overall positive outlook is imperative for overall happiness! These days I try not to stress it too much but here are some tips I’ve found that help with forming a more positive self-image. Instead of looking and judging each individual part as a positive or a negative feature, look at yourself as a whole person and relish in how amazing you are! You know how we’ve been programmed to politely decline compliments from friends, family or colleagues? The whole “Thanks but…” or “Oh no, so and so is so much better”. Quit it! Now I’m not saying to be an ego-maniac but accept those compliments and say thank you! Instead of judging how it looks, let’s take a moment to appreciate all the wonderful things your body does for you each day. Are you breathing? Are you able to go for walks or lift weights? Run around, play with kids or enjoy time with friends and family? That’s all thanks to you and your amazing hard-working body- enjoy it! Chuck out all those clothes that are too big or too small. In my experience, clothes that are too small make me feel extra critical of myself whenever I check to see if they fit despite the fact that I know my body is different than it was years ago and clothes that are too big make me feel badly for thinking about how I used to be “XYZ” size. The past is the past- focus on loving yourself now and feeling amazing each day. This should be a well-known fact but sometimes it can still be hard to truly remember and internalize but yes, everyone is unique and every body is different. There’s no need to compare yourself to others- there isn’t one type that’s better than another. Everyone is amazing in their own way and enjoy what makes your different and spectacular. In the end, life is about living. Please take a moment to love yourself today and live your life! If you have struggled with your self-image, tell me about it and let me know what has worked or hasn’t worked for you. Subscribe to my mailing list to receive weekly post updates and content just for subscribers!